During the Art Rotterdam Week of 2016 Assembled by Root will be presenting a very special pop-up exhibition in collaboration with the Niffo gallery. Continuing its dedication to showcase and aid the growth of young talent, ROOT will be exhibiting the works of six up and coming artists, who focus their works around the theme That Missing Thing. Through working together with local organizations such as Niffo, and by bridging the gaps between artists at the start of their careers and visitors with an interest towards contemporary art, Root is determined to further an inclusionary system which promises a mutually beneficial and truly meaningful experience for all involved. Though wildly different in medium and narrative alike, the works of Sophie de Vos, Philine van den Hul, Raquel Huijgen, Maria Kokkonen, Inouschka de Nooijer, and Tonny Yang, the six artists exhibited during the Art Rotterdam Week, all demonstrate a curiosity for the absent, for the boundaries that frame and create it. Through poetic imagery – or, on the contrary using the lack there of it – to spark the imagination, the artists manage to create an air of intimacy resonating from their works as they explore everyday moments often neglected and passed by. Whispering tales of fragility, of longing, the artworks presented reach out to the common desire within, to embody and name, to make visible that what which cannot be seen, be that missing thing space in-between, emotions words fail to express or time itself. 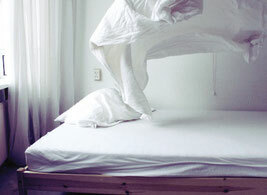 Sophie de Vos is a young photographer, a recent graduate of the ArtEZ Institute of the Arts. In her works she creates touching narratives though soft imagery. 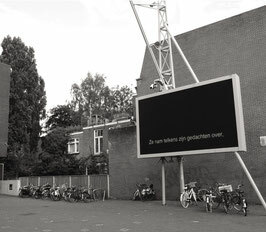 In her work Sophie combines photography and linguistic work, often presented together as installations. By pushing herself into uncomfortable positions Raquel Huijgen creates photographs that reflect the inner discomforts we are often willing to put ourselves through to please others. By portraying her distorted body through soft images she raises questions of actual and perceived expectations. Inouschka de Nooijer sees the making of invisible images as an inquiry. Her work is an investigation into the image - or rather the imagination. 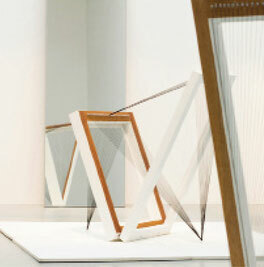 She investigates the ‘gap’ between what is visualized and what is interpreted by the viewer. Inouschka questions how images transmit meaning, through evoking the imagination of the viewer to create them. Creating paintings, drawings and objects Maria Kokkonen aims to studying the role memories play in the construction of ones personal identity. Maria sees the visual language as a method to reach the boundaries of substance, and to explore the concept of self. 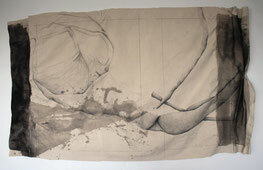 She works intuitively and flexibly with the materials she uses used, allowing the image to emerge from the process. Philine van den Hul strives to fill up spaces using, repeatable objects or large series of paintings and drawings. ‘There is no name for this space’ is a project revolving around the concept of the ‘semi-area’, the gap between the private space of the home and the public space outside it. 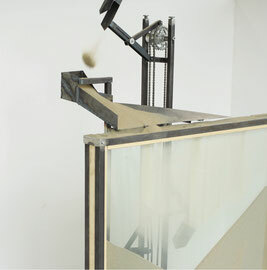 Tonny Yang, student of the University of the Arts Utrecht, brings a mesmerizing machine of an installation to the exhibition. Playing with the concepts we hold of time, the artists visualizes its passing in a constant loop of metaphor.